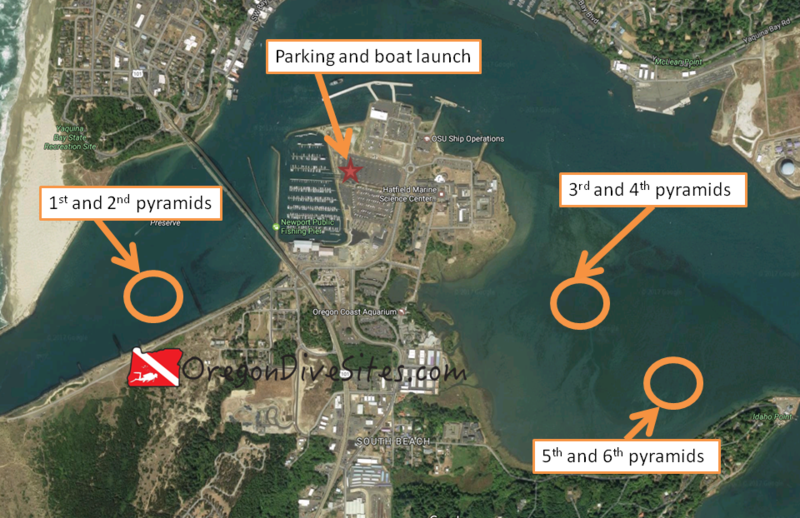 The OSU Research Pyramids are a series of six underwater cinder block structures at three different sites in Yaquina Bay. While you could technically dive these from shore, the surface swim would be very long and annoying. This is a great boat dive in the bay. The pyramids were once used for juvenile rockfish studies around 2008-2010. We don’t know if they are still being used for research but the buoys still appear to be maintained. Not many people dive these structures aside from research scientists attached to Oregon State University’s Hatfield Marine Science Center. There isn’t any good spearfishing or crabbing on the pyramids but the pyramids are covered in tiny marine life which makes them an interesting dive for people who like looking at tiny creatures underwater. The first and second pyramids are between the first finger and second finger of the south jetty in Newport. Look for the orange marker buoys. We love going to dive the OSU Research Pyramids sites to look for juvenile rockfish like the OSU researchers used to do. Back when the pyramids were actively being used for research, buddy pairs of divers would visit the pyramids regularly to do juvenile rockfish counts. They would use toilet bowl cleaners or dryer vent cleaners on long wooden poles to push juvenile rockfish out of the cinder blocks and into a big net. Then they would count how many rockfish and other species they captured. Genetic samples would be taken from some of the fish and some fish had a small snip taken out of one of their fins so that they could be identified in the future. Another highlight is the mystery surrounding Pyramid 5. One day when the OSU research SCUBA divers went out to do their rockfish study, Pyramid 5 had disappeared! Over the next several months, they searched the entire area in a grid pattern, with ropes, and using several other search techniques but they never could find it. Even using the GPS coordinates that they had recorded for the pyramid’s location turned up nothing. You might think that this wouldn’t be that big of a deal. After all, these aren’t that big of structures, right? Wrong! These pyramids are about the size of a love seat and are held to the bottom with about 10,000lbs of lead weights! The prevailing theories over the disappearance of the fifth OSU Research Pyramid are 1) it sunk into the mud suddenly, 2) someone managed to steal the pyramid which would require a massive crane to get it to break free of the bottom, 3) aliens. Pyramid 5’s disappearance is still talked about to this day among our group of SCUBA friends who went diving on it before the disappearance. Maybe you will be the person to find the missing Pyramid 5! Take the aquarium exit from US101 and then follow signs to the marina and boat ramp. There is plenty of trailer parking by the boat ramp for your truck and trailer after you’ve put your boat in the water. The three sets of OSU Research Pyramids are interesting dives if you can find them. This site is spread across three different areas all accessible by boat. All of the pyramids (except for that tricky Pyramid 5!) are supposed to be marked with orange buoys that at very high tides will be 1-2 feet below water. The buoy markers are supposed to be maintained forever until the research pyramids are removed from the bottom. Based on how hard it will be to ever get those pyramids up off the bottom, we expect the buoys will remain for many years to come. Each research pyramid is around the size of a love seat. There are several rows of cinder blocks that form a sort of pyramid and are held together with metal plates. The last time we went diving on the pyramids, the lowest set of cinder blocks was already underneath the sand and mud. By now, the next row up has probably submerged beneath the muck. Each grouping of research pyramids has the pyramids generally within 100 feet of one another. We tried navigating between the pyramids a few times but it is difficult hit one pyramid underwater when starting at the other. We suggest you surface and move with your boat over to the other pyramid rather than try to find it underwater. While you could do some epic surface swims to the different OSU Research Pyramid sites, we suggest that you use a boat. The marina on the south side of the Yaquina Bay Bridge is the best place to put your boat in the water. This is a boat dive unless you love swimming very long distances in SCUBA gear. Usually the conditions are pretty decent. The pyramid sites are all outside of the shipping channels but you may still get some wake occasionally from passing boats. The pyramids do get some current from the Yaquina River although they are far enough outside of the channel that it isn’t as bad as what you experience out on the third finger on the south jetty. The first and second pyramids usually have 10-15 feet of visibility. The bottom here is mostly sand. The third and fourth pyramids usually have about 10 feet of visibility. The bottom is mixed sand and mud and can be stirred up. The fifth and sixth pyramids are in the 5-10 foot range of visibility. The bottom is mud and will get stirred up easily. 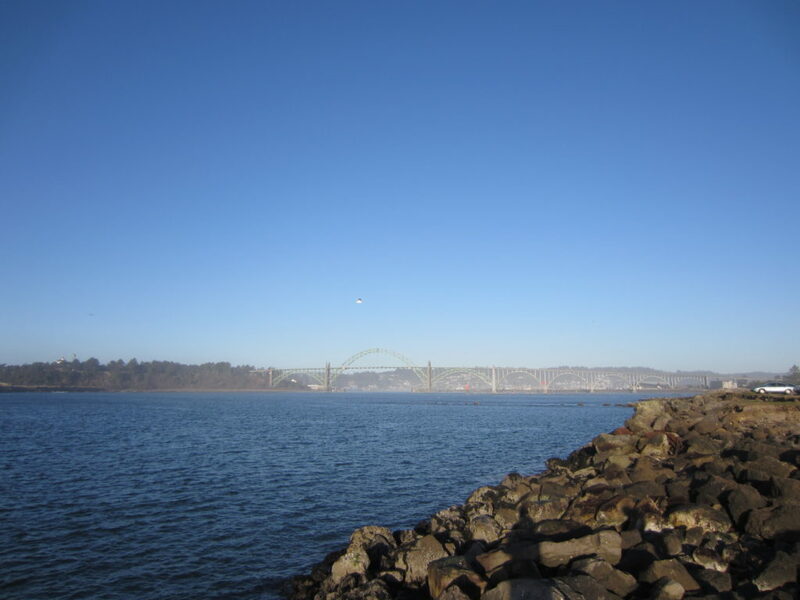 Temperature varies based on where you are in the Yaquina Bay and river conditions. We have seen 42-55F depending on the time of year. Summer is a good time to dive these sites. The water is a little warmer and it’s fun cruising around on a boat in Yaquina Bay when the sun is out. At an extremely high tide, you might get 25 feet at the first and second pyramids. Normally you’ll be between 15 and 20 feet though. You will want to know how to dive from the type of boat you are using. Open water divers can do these dives but we still rate this on the low end of an intermediate dive because of the potential for having zero visibility if the bottom is stirred up and for the current that can sometimes impact these sites. This is an intermediate dive although open water divers can do these dives if they have experience diving from a boat. If you are smart with prepping your gear and loading it onto your boat before you go out into the water, you won’t have to walk anywhere. Motoring along with your boat can take 20-30 minutes to reach the 5th and 6th research pyramids though. No surface swim unless you really want to do this as a shore dive. We suggest you ask for permission from the Heppell Lab at Oregon State University before you dive the OSU Research Pyramids. The lab owns the pyramids and they may not want divers playing around on their research experiments. Looking inside of the cinder blocks is fun. We suggest taking a dive light along to check out what’s inside. We have the dive lights we use every time we got SCUBA diving in Oregon listed on our Gear We Use page. There is a local dive shop in the South Beach area of Newport. They have gear rental, gear repair, air fills, and some gear for sale. There are a lot of good restaurants on both sides of the Yaquina Bay. 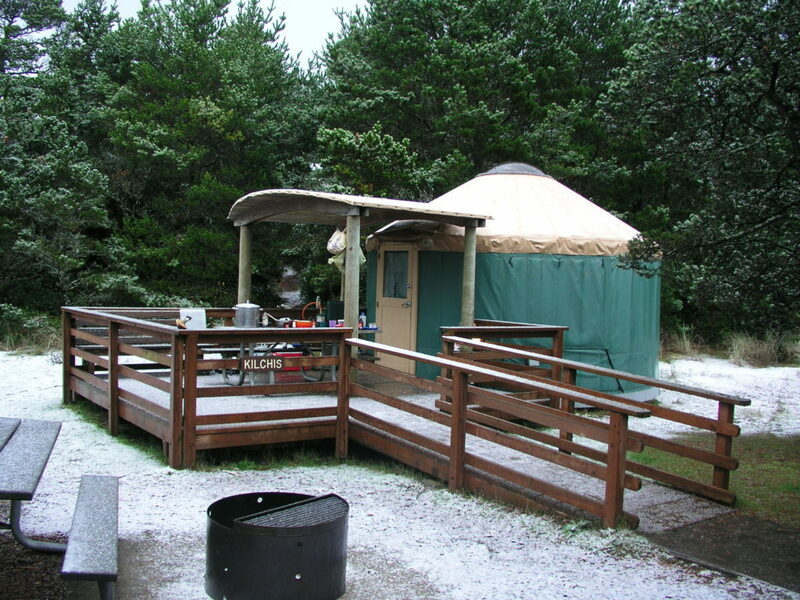 South Beach State Park is a good place to go camp or rent a yurt at when you’re diving in Newport. We have stayed here many times and enjoy the campground and the easy access to the beach. We have not tried out any of the hotels in town. Please let us know if you have found a SCUBA diver friendly hotel in Newport!